"These are the puppies of my pair of Shar-Pei, Jaena and Arthas, at 3 weeks old! I call these "The Three Towels" because of their appearance. These dogs are living here in the Philippines. 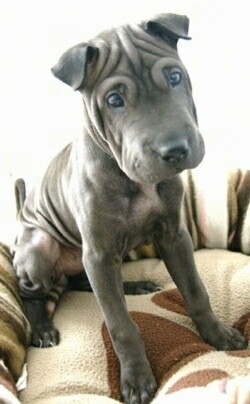 Shar-Pei are growing popular here." Calli the three-year-old brush-coat Shar-Pei—her owner says, "She is the sweetest dog in the world and is a goofy clown, especially around her family. She is a bit of a chunker at 46 pounds and has a beautiful reddish coat. Calli has been blessed with good health and I cannot imagine life without her." 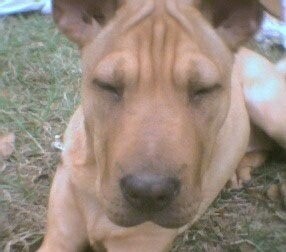 China, a Shar-Pei at about 3 to 4 months old resides in Playa del Carmen, Mexico. 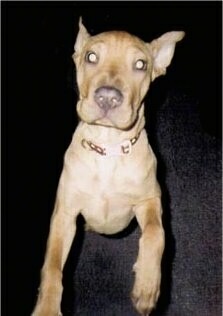 Suki the Shar-Pei puppy at 5 months old—"Suki at 5 months old and tipping the scales at 50 pounds!!! Her latest pastimes include: eating everything that isn't smothered in apple-bitters, snoring louder than the TV, and stinking up the room (well at least daddy says it’s the dog and not him). She loves to play fetch, chase her tail, and play "keep away" with my slippers in the morning because she knows it drives me crazy. "We just love her to pieces. How could we not? Just look at the angel face…ha! (in this photo she is doing the hind-leg bounce while whimpering in doggie language "please pick me up, I am just a baby still""